At least 76 stars of spectral type "A" (not including white dwarf stellar remnants) are currently believed to be located within 100 light-years or (or 30.7 parsecs) of Sol. Of those stars, astronomers believe that five have evolved out of the main sequence into giant stars, while an additional 17 or so may be subgiants (more on nearby giants and subgiants). 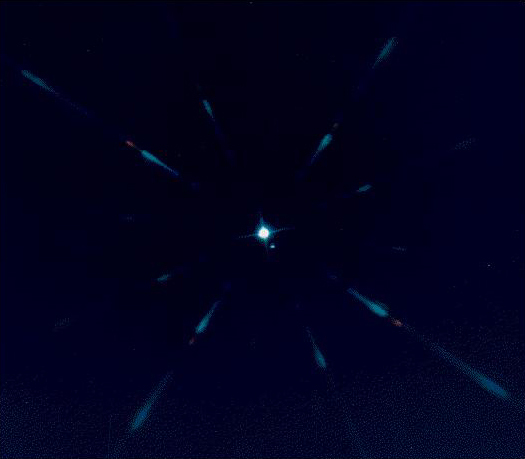 Four A-type stars are the most luminous stars located within Sol's immediate neighborhood (within 10 parsecs or 32.6 light-years): Sirius A, Altair, Fomalhaut, and Vega. Due in part to their relatively proximity and abundance, these relatively brighter, large, and more massive stars are visually prominent objects in Earth's night sky, where five of the 20 brightest (in apparent magnitude) stars are spectral type A.
part of a binary system. Compared to cooler and dimmer F ang G type stars, A types radiate more light towards the ultraviolet end of the spectrum. Main-sequence A stars have surface temperatures of 7,100 to 9,750 K and luminosities of seven to 80 times that of Sol. A-type dwarf stars appear to have between 1.5 to three Solar-masses, which indicates that these stars may spend from three billion to only 400 million years in the main sequence fusing core hydrogen. The spectra of A-type stars are dominated by hydrogen and neutral and singly ionised metals which fade with increasing temperature. These stars have the darkest ("strongest") Balmer lines of hydrogen, but helium lines are not visible. Hydrogen absorptions are much weakened in A-type supergiant stars but are conversely strengthened in white dwarf stellar remnants, due to increased gas pressure. A-type giant stars are only a magnitude or so brighter than main-sequence A-type dwarf stars and are only around half as much larger in diameter. As a result, astronomers do not find it very useful to compare Balmer lines in differentiating between A-type dwarf, subgiant, and giant stars. 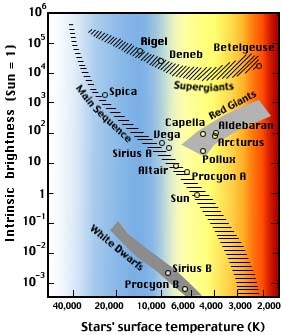 According to professor James Kaler, astronomers rely on "subtle positive luminosity effects" from the spectra of doubly ionized iron and silicon (Fe-II and Si-II) to make such determinations (James B. Kaler, 1997). A-type supergiants, however, are much easier to detect; Deneb, an A2 supergiant with around 25 Solar-masses and some 200 times Sol's diameter, shines with around 160,000 times Sol's luminosity (at an estimated distance of some 2,600 light-years). The following celestial objects are located within 31 parsecs, 100 light-years (ly), of Sol. 82? Hip 24502 A2 ? Bootes Bad parallax?, Hip 24504 comp. Summary information on blue-white B, yellowish F, yellow-orange G, orange-red K, and many red M stars within 100 light-years are also available. Try Professor James Kaler's Stars site for more discussion of spectral classification as well as information on individual bluish white stars.